An illustrated storybook, much like the kind you so enjoyed as a child, back when everything was safe and happy and…stuff. A sentence flashcard pack for use with an SRS (a lot like “MFSP”, with even cooler formatting), containing phrases from and inspired by the book. 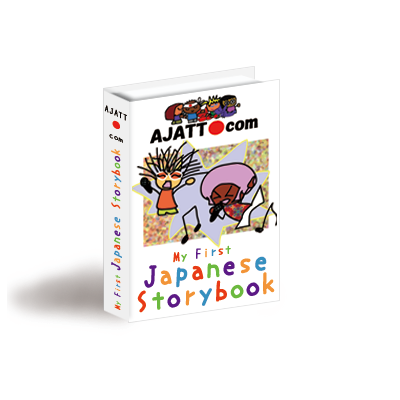 My First Japanese Storybook is intended for anyone at any level of Japanese, from egg to caterpillar to butterfly. As long as you’ve gone through Remembering the Kanji and know your kana, then you, too can read and enjoy the book — thanks in no small part to the ruggedly handsome support materials (translation, SRS deck). I Want Mine! Gimme One! And you can have one. Your AJATT Plus subscription will automatically continue beyond the first, free month unless you cancel it. If you don’t want the subscription at all, you may cancel it at any time (even right after your purchase) and still keep your free month of AJATT Plus anyway. Aren’t I awesome? Two (count ‘em — 2) super special secret freebies, worth $45.97! I’m not saying there’s going to be something like another sentence pack inside there, or some sort of MCD mini-guide (a subset of the MCD Revolution Kit) inside, because, no, the super special secret freebies are…a secret, and telling you what the secret is would ruin the surprise, I mean, duh. All 100% DRM-free. No DRM whatsoever: You’re a good person. I hate DRM. I trust you. I know you’re not going to screw me over. I believe you should and must have the right to remix (copy and paste, etc.) information for your personal, educational use. I believe that information is for fiddling with, not just looking at. I believe that you, a paying customer, should and must not be treated like a freaking criminal and subjected to ludicrous, draconian restrictions on how you manipulate data you paid for for you own consumption. 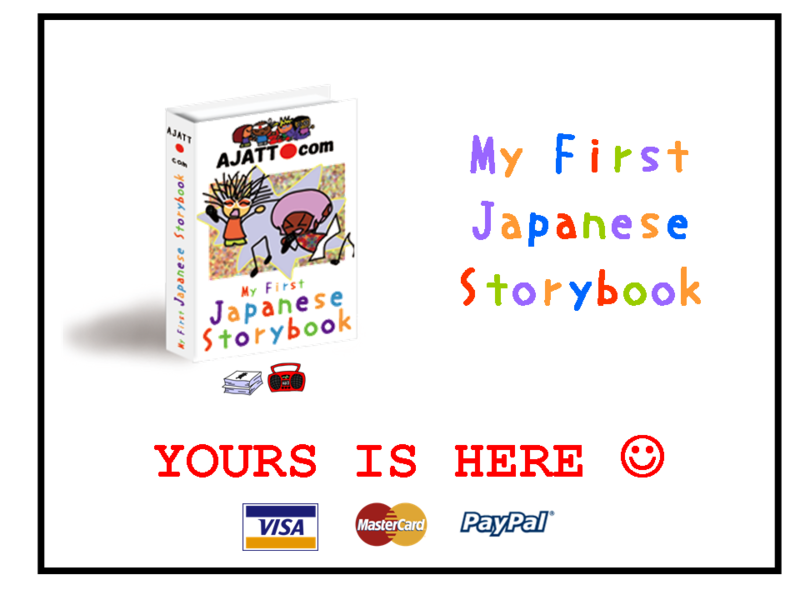 My First Japanese Storybook is easy to copy and paste and otherwise manipulate digitally for your personal, educational use, so that you can get the maximum possible value out of it. Buy It. Try It. No Likey? No Payey! Let me be Khatzumoto with you: I don’t know what I’m doing. I’m still new at this product-making stuff. Maybe you’ll like the storybook, maybe you won’t. 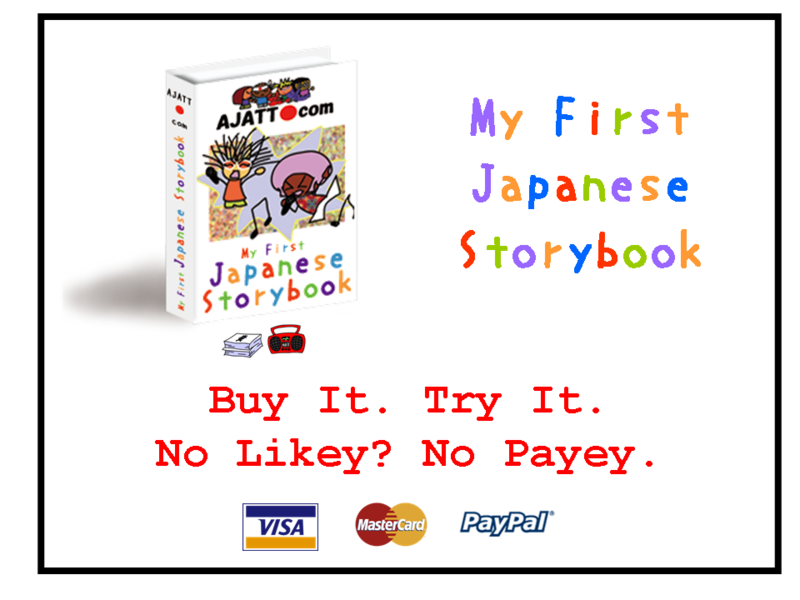 So, as with all its predecessor products, My First Japanese Storybook comes with a 100%, no-questions-asked refund guarantee. If you don’t like it, just email refund at ajatt dot com. One word: “refund”, will suffice -– you don’t need to give a reason. You’ll get your money back, and you can keep the storybook for free. That’s just how we roll up in here at “the ‘JATT”. May I See A Sample First? Khatz, you need to stop the refund thing – it makes it too easy for people to get your stuff for free because they’re pretending to be unsatisfied with it. Not a smart business move on your side of things, IMHO. Could you put up a sample page? I might want to see something like that before I buy it. マイファースト初めてのジャパニーズ絵本 -> it’s great, it’s fun and the author is shameless crazy (I hope he will appreciate). Pictures were probably done by a grown up child called Khatzumoto. Voices are good. You won’t find another great crazy japanese book like this one. You will like it if you like the AJATT fun. As always when a book is good, it’s too short. Khatzumoto : next time could you deliver also a spreadsheet for SRS items? First of all, hit 500th Kanji today! Second, this looks totally awesome. Once I finish up RtK I’ll be first in line for my copy. Thanks for all your awesomeness, Khatz! I have a ton of クラップ to do, but I’ll get around to reviewing it in the next few days. I expect nothing short of awesome. Even if my mommy is a guy. lol i know you read these even if you dont reply anymore…”family values” “can I see a sample” your secret is out! Congrats of creating and releasing your own product. It looks like fun. Would it be suitable for children?? forum.koohii.com/ I wouldn’t have been learning Japanese effectively and enjoying it as well.